Heat oven to 325°F. Generously spray 12-cup fluted tube cake pan with cooking spray. Unroll both cans of dough; separate into 16 triangles. Cut each triangle lengthwise into 3 narrow triangles. Place 1 piece of cheese and 1 sausage on shortest side of each triangle. Roll up each, starting at shortest side of triangle and rolling to opposite point. Randomly place crescents in pan at different angles. Bake 45 to 50 minutes or until crescents in center of pan are cooked through (at least 195°F). Cool 5 minutes. Use metal spatula to loosen edges, and place heatproof plate upside down over pan; turn plate and pan over. Tap bottom of pan, and remove. Using serving plate, turn over again. Allow to cool 10 minutes before serving. For a spicy version, use pepper Jack cheese instead of Cheddar. 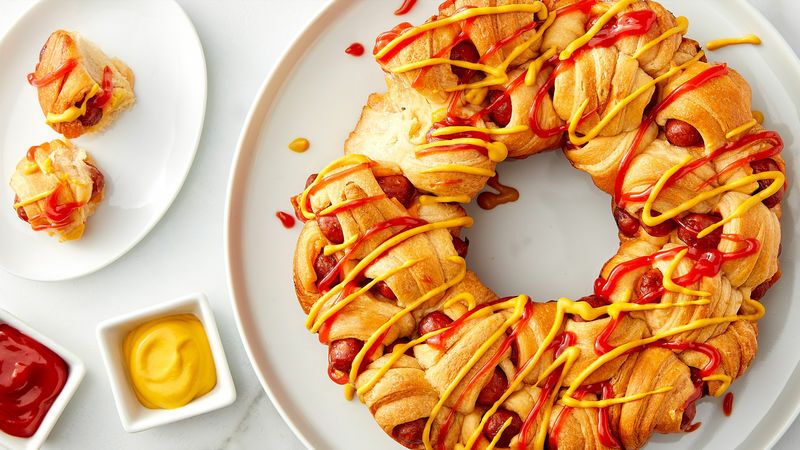 Allowing the ring to cool out of the pan makes the mini crescent dogs easier to pull apart.